The first comprehensive biography of a true pioneer, George Hunt Williamson. A world premiere! Most of the information results from the perseverance, the passion and the painstaking investigative efforts of researcher and author, Michel Zirger.The reader will find a great many revelations, in particular about the first “Close Encounter of the Third Kind” in modern times, at the end of which photographs and plaster casts of alien footprints were made; the unexpected connection between Williamson and the famous Italian Amicizia (“Friendship”) case; and his mystical stay in the Andes. Williamson’s life is totally “revisited” thanks to unpublished documents now in Michel Zirger's possession, which will end errors and gossip that has been rehashed for decades.We owe Williamson for the concept of “Ancient Aliens,” developed in seminal books such as Other Tongues–Other Flesh, Secret Places of the Lion, Road in the Sky and Secret of the Andes. Maurizio Martinelli’s erudition offers innovative insights on certain aspects of George Hunt Williamson’s life, for instance, the affinities of his work with that of Zecharia Sitchin.Martinelli is the Italian specialist of George Hunt Williamson. An accurate researcher with a fair and balanced view, he forms the perfect tandem with Michel Zirger to decipher the life and work of this enigmatic figure, whose influence remains strong in the field of ufology and esotericism. 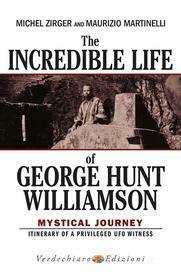 Scrivi una nuova recensione su The Incredible Life of George Hunt Williamson. E-book e condividi la tua opinione con altri utenti.